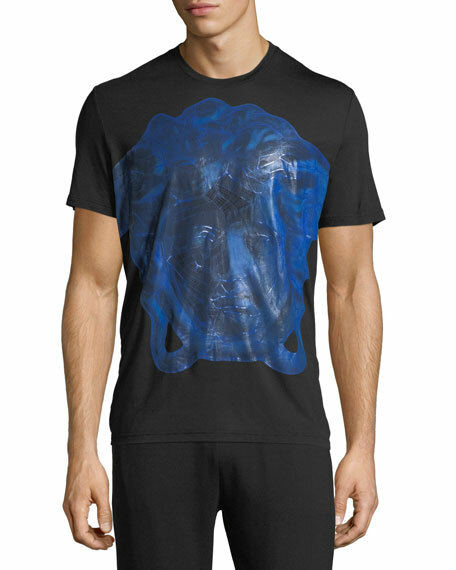 Versace T-shirt with Dionysus graphic. Versace T-shirt in solid jersey-knit. V neckline. Short sleeves. Logo detail at left chest. Slim fit. Straight hem. Cotton/spandex. Made in Italy. Model's measurements: Height 6'1"/185cm, waist 32"/81cm, typically wears size M.
Versace T-shirt with typographic logo. Crew neckline. Short sleeves. Relaxed fit. Straight hem. Cotton. Made in Italy. 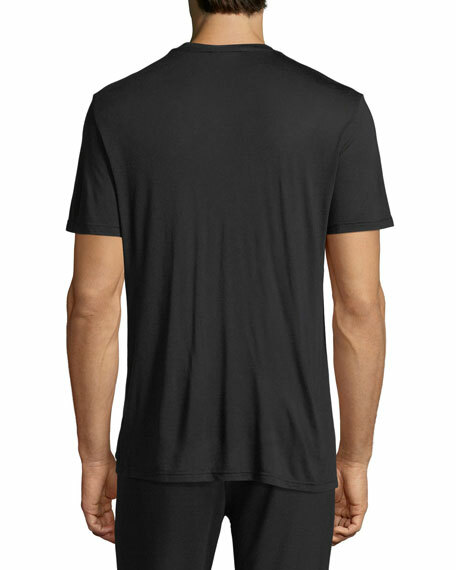 Versace velvet T-shirt with embossed logo. Crew neckline. Straight hem. Pullover style. Polyester/spandex. Made in Italy. Versace T-shirt with embroidered logo and male figures print. Crew neckline. Seamed short sleeves. Pullover style. Cotton. Made in Italy.